Syria’s army has broken a years-long Islamic State siege on the government enclave of Deir ez-Zor, according to state media. The Isis group has already lost more than half of its nearby bastion of Raqqa to US-backed forces, and the loss of Deir ez-Zor city and the surrounding oil-rich province of the same name would leave it with only a handful of isolated outposts. Syria’s army and allied fighters, backed by Russian air support, have been advancing towards Deir ez-Zor on several fronts in recent weeks, and on Tuesday, Sept. 5 arrived inside the Brigade 137 base on the city’s western edge. “The Syrian Arab army this afternoon broke the siege on Deir ez-Zor city after its advancing forces arrived from the western province to Brigade 137,” the Sana state news agency said. 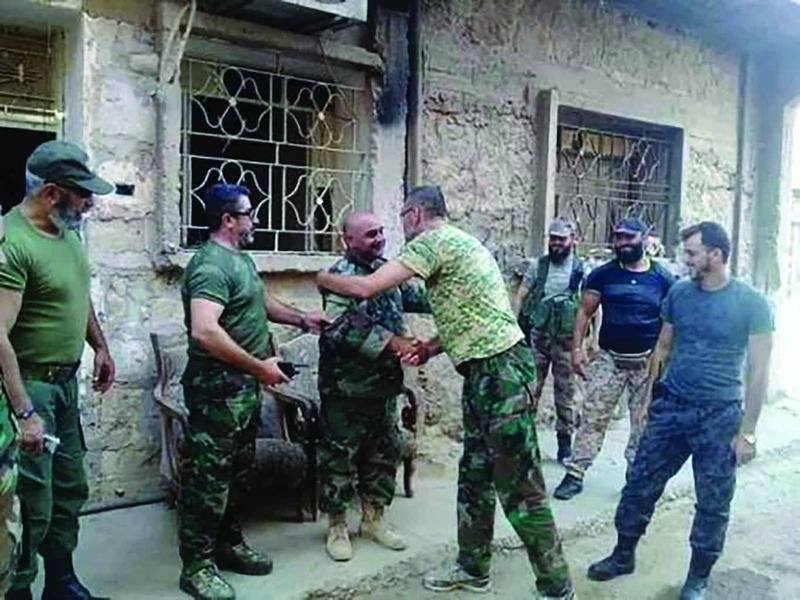 “This great achievement is a strategic shift in the war on terror and confirms the ability of the Syrian Arab army and its allies,” the army command was quoted as saying. A local journalist contributing to Agence France-Presse on the ground said a minesweeper moved ahead of troops as they arrived at the base. As they reached the soldiers who have been trapped in the base and adjacent parts of the city, the troops embraced and shouted patriotic slogans. Others fired in the air and flashed victory signs, as Syrian and Russian warplanes flew overhead. President Bashar al-Assad congratulated troops in a call to commanders at the base, his office said. “Today you stood side-by-side with your comrades who came to your rescue and fought the hardest battles to break the siege on the city,” he said. A source in the Deir ez-Zor governorate said trucks carrying food and medicine arrived from Aleppo on September 5. Government forces and tens of thousands of civilians in the city had been trapped under the Isis siege for more than two years, facing food and medical shortages. Earlier this year, the government-held parts of the city were cut in two by an Isis offensive. The army’s advance on Tuesday broke the siege on the northern part of the city, but a southern section, which includes a key military airport, remains surrounded, with the army 9 miles (15km) away. About 100,000 people are believed to be inside government-held areas of Deir ez-Zor, with perhaps 10,000 more in parts of the city held by Isis. The army still faces a potentially difficult battle to break the siege in the south of the city and free its remaining neighbourhoods, as well as the surrounding province. But for the government, its success would be “one of the most symbolic victories in its six-year war”, wrote Syria analyst Aron Lund in a recent analysis. “The reopening of the Deir ez-Zor road is a strategic disaster for IS, which is now at its weakest since 2014 and seems unable to break out of an accelerating spiral of defeats,” he wrote. Isis has lost more than half of Raqqa to an offensive by the US-backed Syrian Democratic Forces, an alliance of Kurdish and Arab fighters. And in neighbouring Iraq, it has lost 90% of the territory it once held, including the city of Mosul. Throughout the siege the government continued to fly limited supplies into Deir ez-Zor by helicopter, and the UN last year began airdropping humanitarian aid. The army began its offensive to reach the city in earnest last month, and has advanced on multiple fronts, including from the neighbouring Raqqa province to the west and central Homs province to the south. It has been supported by Russia’s military, which began an intervention in support of the government in 2015. On Tuesday, Moscow said a Russian warship fired cruise missiles from the Mediterranean in support of the Deir ez-Zor offensive. More than 330,000 people have been killed in Syria since the conflict began in March 2011 with anti-government protests before spiralling into civil war. The Kashmir Observer noted that the estimated 100,000 residents who had been holding out in the Syrian-government held half of the city, including the airport and an army base, since Islamic State of Iraq and the Levant (Isil) seized control of the area in 2014, have faced shortages of food and medicine throughout the siege, alleviated by the World Food Programme making regular drops of food into the city, according to the NGO Siege Watch. “The Syrian Arab Army has advanced on the Brigade 137 base front on the western side of Deir Ezzor city and broken the siege imposed by the Daesh organisation,” state news agency SANA said, using the Arabic acronym for Isil. A local journalist told AFP that flags had been raised throughout the government-held area in anticipation of the arrival of the soldiers, and that jubilant residents were greeting one another: “Good morning of victory”. Deir Ezzor, around 60 miles from the Iraqi border, was an early site of rebel groups rising up against Syria’s president, Bashar al-Assad. Isil then overran rebel positions and circled the government enclave the following year. The breaking of the siege marks another important victory for Assad, whose forces have steadily been retaking ground across the country. It is also deep blow to Isil, which is simultaneously attempting to fight off an attack on its de-facto capital, Raqqa, north of Deir Ezzor.